Is the Kemper Coal Plant becoming Mississippi’s very own money pit? The costs coninue to spiral upward as this polarizing saga continues. Recently, we put together some more thoughts on jumpers for sale this topic in an article (read it here) published in the Clarion Ledger on Wednesday, July 25, 2012. The chart below is offered as an example of top down insight on monetary policy and its effect on the S&P 500 benchmark. Even though the U.S. has operated with a fiat currency since President Nixon closed the gold window on August 15, 1971, gold is still a useful metric in assessing the job the Federal Reserve is doing in providing a stable dollar. Gold is, after all, history’s oldest form of money and still recognized around the world as money. 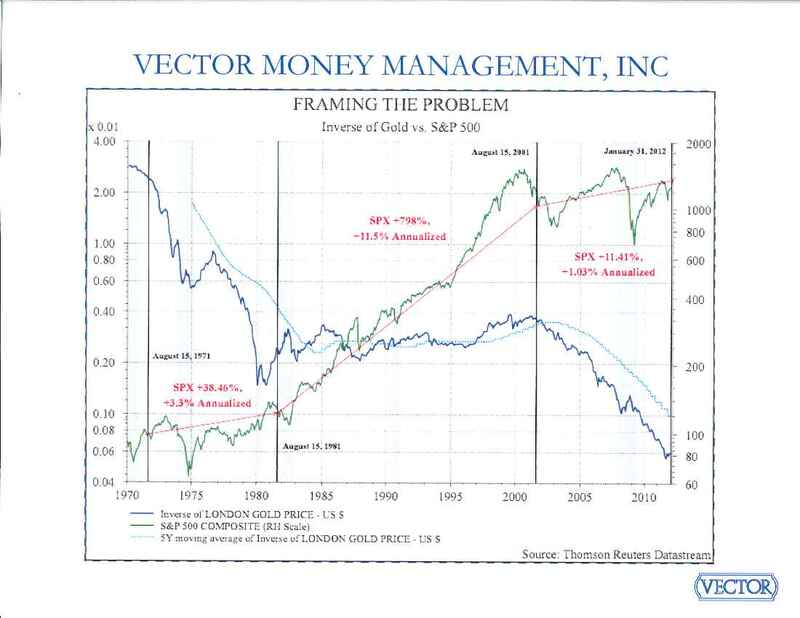 The graph below charts the S&P 500 versus the value of the dollar in fractions of a gold ounce from August 15, 1971 through January 31, 2012. The chart is divided into a 10 year period of a falling dollar, a 20 adult water slide year period of a relatively stable dollar and a 10.5 year period of a falling dollar: The gains shown for the S&P 500 for these three periods do not include dividends. The out-performance by the S&P 500 during the stable dollar period is dramatic. The data strongly supports the notion that the broad economy and the broad market (where the benchmarks focus) perform better with a stable dollar as measured against gold. Common sense also supports that notion. Tens of thousands of contracts, almost all denominated in dollars are signed every day between businesses for delivery or receipt of goods and services. Those contracts are much more likely to be profitable for all parties when the dollar is stable for the life of the contract. Change the value of the dollar and it will be a boon for one party and a bust for the other. Boom and bust is an apt description of the economies and financial markets in period 1 and 3. Lobbying and lobbyists play a crucial role in our political system. Unfortunately, that role can lead to governmental intervention in our “free-market” economy. Too often this creates a scenario where the best connected are given special loopholes - be it through credits, exclusions, rebates, deferrals, or other mechanical bull for sale special tax treatments – or what we call cronyism. Our thoughts on this were recently illustrated in an article published in the Clarion Ledger on January 8, 2012. It seems obvious to us that some part of the world’s ongoing financial and Inflatable Water Slides For Sale economic problems are due to the use (and abuse) of fiat currencies. Our thoughts were highlighted in an article published in the Clarion Ledger on August 14, 2011. Congressional legislation aimed at regulation of certain industries can and does have unintended destructive consequences on the economy – whether we’re talking about an economy seemingly Inflatable Obstacle Course For Sale running efficiently or one trying to recover. Our thoughts on this subject were highlighted in an article published in the Clarion Ledger on July 17, 2011. The most important economic issue for the remainder of 2010 is the fiscal question regarding what tax rates will be in 2011 and 2012. Tax rates figure prominently into personal and business planning, and the fact that the issue is still unresolved with December upon us only adds to the Toddler Bouncy Castle For Sale economic uncertainty. Our thoughts on this vital issue appeared in an article we wrote for The Clarion Ledger, a Jackson, MS newspaper, on November 28th, 2010, and which has been posted on RealClearMarkets.com. As mentioned in our August outlook (see post below), the economy and financial markets continue to struggle with what we call irregular conditions. One consequence of such conditions that is proving both problematic and annoying for investors is the lack of any return on traditional savings vehicles such as Treasury bills, CDs and money market funds. As the rates on these instruments drop below the 1% threshold, they begin to act more and more as virtual mayonnaise jars. Savings and savers have always been a vital and integral part of America’s system of capitalism. That they should now receive next to nothing for their participation is a sure sign of dysfunction in the system. It should, then, be no surprise that citizens are grumbling, the economy is sputtering and that uncertainty reigns. As you may recall, a key economic mantra of the ‘80s and ‘90s was that government deficits would push interest rates up – now that logic has been thoroughly discredited by next-to-nothing rates coinciding with all time high government spending and borrowing. This paradox of almost “no-cost” money and a lethargic economy is stark evidence of the complexity of the national and global economies and the myriad interdependencies therein that Inflatable Tent For Sale create unforeseen challenges and problems when policy makers meddle as boldly in the financial system as they have over the past several years. What is today’s reality? That the Federal Reserve’s primary concern is a further drop in commercial and residential real estate prices – assets that represent trillions of dollars in collateral on bank balance sheets. Their first priority has become preventing another downturn in real estate prices. The empty return for savers is a discouraging side effect. While the Fed may be able to offer “no cost” money to banks that qualify, there is still no free lunch. History shows that the usual result of predicaments such as this is inflation. Savers beware.